Nine TriMet operators were recognized today for their outstanding performance, with three selected as Operators of the Year. Operators qualify for the annual award based on outstanding driving records, customer service and attendance, with the winner selected by their peers. Six other operators were honored for reaching 1 million miles of safe driving. Bus Operator Andy Church, TriMet General Manager Neil McFarlane, MAX Operator of the Year Jason Wang and Mini-Run/Part-Time Operator of the year Fernando Lopez. This year, Andy Church was honored as TriMet’s Bus Operator of the Year. 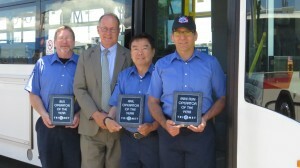 Jason Wang was chosen for light rail’s top award as MAX Operator of the Year. Fernando Lopez was selected as the Mini-Run, or part-time, Bus Operator of the Year. Today’s annual ceremony also included recognizing six operators who have achieved an impressive safety milestone: 1 million miles of safe driving. Bus operators Dowell Kearney, Sally Knigge, Brian Lundquist and James Pope; and MAX operators Jean Strickland and Michael Williams have all achieved 1 million miles of safe driving. This distinguished Million Mile Club record has been achieved by more than 30 active and retired bus and MAX operators. “This is my favorite day of the year when we formally thank our operators, who everyday deliver safe service with great customer service skills. They do an amazing job for the entire region and we can’t thank them enough,” said TriMet General Manager Neil McFarlane. During his 11 years of driving, Operator Andy Church has earned nine National Safe Driving Awards, nine Superior Performance Awards and four years of perfect attendance. Church, who lives in Damascus, has qualified numerous months for Operator of the Month as well as Mini-Run of the Quarter when he was a part-time bus operator. Church is an Extra-Board operator, filling in for other operator shifts and can be found driving routes around the region. He operates out of the Powell garage. Jason Wang was selected as MAX Operator of the Year. The Lake Oswego resident started driving a bus for TriMet in 2000, and switched to MAX in 2007. He is a high performer and has consistently qualified for operator recognition while as a part-time and full-time bus operator, and MAX operator. Wang is a Master Operator and has 12 Superior Performance Awards (SPA). TriMet’s Master Operator Program recognizes bus and rail operators who achieve overall excellence in safety, customer service and attendance. Operators earn SPAs each time they go 1,960 hours of work without any preventable accidents, warnings, reprimands or suspensions. Riders can find Wang operating MAX on the Red and Blue lines out of Elmonica Yard in Beaverton. Fernando Lopez has been driving for TriMet since November 2003, and delivers a solid record for safety, customer service and attendance. As a part-time or “Mini-Run Operator” Lopez has received eight Safe Driving Awards, which means he’s driven eight years without a preventable accident; he’s earned a 100 percent Customer Satisfaction Award and has had perfect attendance for the past eight years. Lopez hails from Beaverton and drives one of the busiest lines among TriMet’s 79 bus routes, the – the 57-TV Hwy/Forest Grove that runs between Beaverton, Hillsboro and Forest Grove. He was a Mini-Run Operator of the Quarter back in 2009. Because of his long record of safety, good customer service and attendance, he’s qualified for the Mini-Run Operator of the Quarter two-thirds of his 11-year career. Lopez drives out of TriMet’s Merlo Garage located in Beaverton. This year 796 operators earned a National Safety Council Safe Driving Award, which means they have had no preventable accidents for the year. This includes bus operator Ed Frey who earned his 43rd annual National Safe Driving Award. Frey started driving in 1977. For the six operators being inducted into the prestigious Million Mile Club this year, it takes about 29 years of safe driving to reach the million mile mark.